THE PUBLISHED COORDINATES IS LOCATED AT JOCKEY HOLLOW NATIONAL PARK WHERE YOU MUST OBTAIN THE INFORMATION TO FIGURE OUT THE FIELD PUZZLE. THE FINAL CACHE LOCATION IS HIDDEN IN NEARBY LEWIS MORRIS COUNTY PARK. 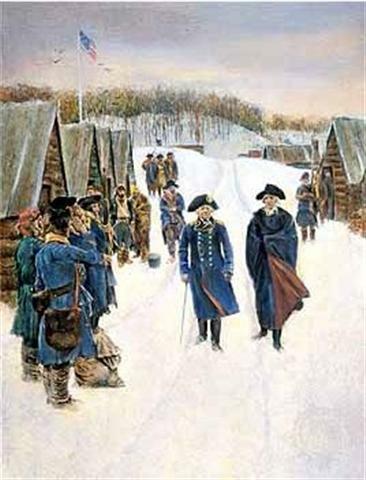 The Continental Army of over 10,000 soldiers reached Jockey Hollow, their "wintering ground" in the bitter weather of December 1779. The area was a windswept forest in the hills a few miles southwest of Morristown, NJ. Morristown at the time of the time of the American Revolution was a farming village of approximately 250 people. With a large area of trees for hut construction. The farms in the area grew various crops including wheat, corn, rye, oats, buckwheat, apples and flax. The Wick and Kimble farms, in the hills approximately four miles southwest of Morristown – called Jockey Hollow – included the windswept forest that became the “wintering ground” for the Continental Army, well over 10,000 soldiers. The area was a windswept forest, and, as it was an advantageous position, they were expected to encamp there for a long while. It was used by portions of the Continental Army for a total of 24 months during the American Revolution, including that famous winter of 1779-1780. Washington ordered that his army build a “log-house city” there. But when soldiers first arrived in Jockey Hollow for their winter encampment, no log houses were yet built, and they had no choice but to sleep out in the open in the snow. Wagons with tents arrived a few days later than did the soldiers. More than 600 acres of oak, walnut and chestnut were converted into lines of soldier huts that rose on the hillsides. Impeded by the weather, the work of felling the great forest and erecting hundreds of cabins went slowly. Almost all of December, the men slept under tents or with no covering at all. A number were not under roofs until February the following year. There were about 1,000 to 1,200 log structures in Jockey Hollow. Eight infantry brigades occupied the site for seven months. General Washington had ordered that enlisted mens’ huts were to be built first. Therefore, officers’ huts were not built and completed until all the enlisted men were settled theirs. It took about two to three weeks for the soldiers to build their huts. The majority of the enlisted men in the Continental Army were poor, lower class men. A good number of these men were not even born in America. Army officers, on the other hand, were from middle to upper class society and were often land owners. The enlisted men moved into their huts around Christmas. The last of the officers didn’t have their huts until mid February. In all, there were about 1,000 to 1,200 log structures built in Jockey Hollow. Each measured 14 feet by 16 feet and housed 12 men. JOCKEY HOLLOW CEMETERY PLAQUE ~published coords. E = HOW MANY OF THE IRISH BRIGADES AT JOCKEY HOLLOW WERE COMMANDED BY GENERALS BORN IN IRELAND?